Ever wonder where your flowers come from when you buy them for a special occasion? Chances are, they come from Colombia. The flower business is a $3Billion flower industry, just behind the flower production in the Netherlands. Flowers from all over Colombia are picked and shipped by plane every day, and 70% of all that production goes to the United States. 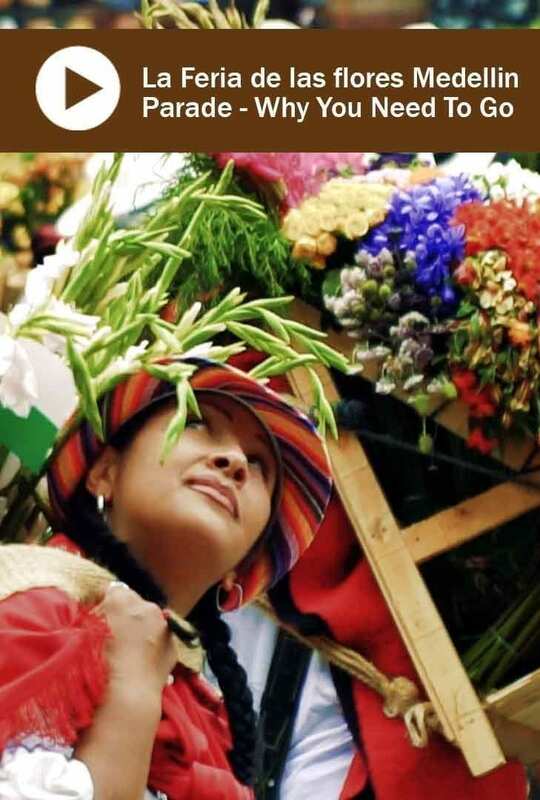 The state of Antioquia is one of the largest producers, and the Paisas (the people of Medellin and area) celebrate their thanks to the flower industry every year with la Feria de las Flores Medellin or in English we call it the Medellin Flower Festival. 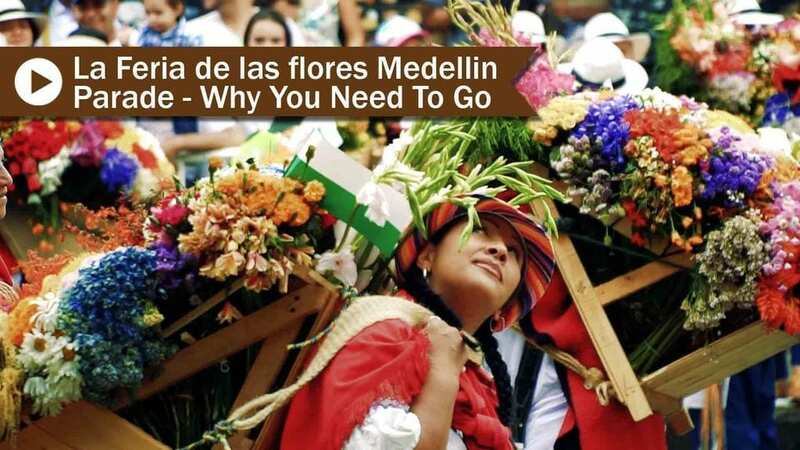 The Festival de las flores Medellin, The Flower Festival of Medellin, Colombia has been going strong for 61 years. Even in the 80’s and 90’s the dark and challenging times for Medellin, the event still went on. It was initially created as a tribute to the flower industry in Antioquia and has expanded into a 10-day Mega-event of music, concerts, expositions, food, events and even an antique car parade – all with an ode to flowers in beautifully decorated settings. We were amazed by the size and scale of the events, the moving of concert stages around the city and the joy that Paisas showed throughout the event. The stars of the parade are the silleteros de medellin, they are the flower vendors and farmers from the nearby mountains and town called Santa Elena, close to Medellin. This is a tribute to the history of growing and selling flowers in the area. Not anyone can be a Silletero. The role is passed down by generation, even the children featured in the parade have to be members of the families of Flower growers. If You Missed the Video Above- Check Why The 2018 la feria de las flores Medellin Parade was so spectacular. The parade (in Spanish - Desfile de silleteros) this August included 500 men, women and children carrying their silletas --- or the wooden chairs on their backs throughout the show. This backbreaking but essential role was praised by the audience – and when it looked visibly difficult for them, they received energetic cheers and praise with “Si Se Puede” – Yes You Can!! We were particularly touched by the pride each of the Silleteros had for their creations and how visibly emotional they felt by the cheers and hollers from the crowd. I couldn’t hold back my tears of emotion. We highly recommend you not only travel to Colombia and Medellin, but you find a way to come for la feria de las flores. When: Every August – in 2018 it was August 3-12th, so every year it is around that time, starting on a Friday and ending on the Sunday, 10 days later. Where: Events are held all over Medellin and Santa Elena Colombia for the 10 days. There are literally hundreds of events to choose from, check the resources below for more details. Tickets: Most events are free. However, you can buy grandstand tickets for the parade which we highly recommend through Ticket Express – but they don’t go on sale until Early June. There also tonnes of ferias en Medellin here is the guide to more festivals! We hope you enjoyed our video, and we hope you make it to Medellin to see la Feria de las Flores and stay to the end to see the Desfile de Silleteros. Have you been to the Fiesta de las flores Medellin? If so we would really love your additional tips to add to this post. You can join a tour anytime of the year and see the magnificent flowers that make up the Medellin flower festival and flores colombia. Looking to join a flower tour in Medellin or Santa Elena, click here to see options. Or this Flower Farm and Park Arvi tour is Medellin. For more information about Traveling In Colombia, you can find more travel posts here. Looking for some travel inspiration? We have many more destinations to share. Please share our post on Pinterest! Thanks!